This preview has been provided by UNC School of the Arts. The renowned ensemble Chamber Music Society (CMS) of Lincoln Center returns to the University of North Carolina School of the Arts (UNCSA) for its second and final concert of the 2017-18 season. The program – which juxtaposes two of Romanticism’s musical giants: Antonin Dvořák and Johannes Brahms – will be held at 7:30 p.m. on Thursday, February 1 in Watson Hall on the UNCSA campus, 1533 South Main St. in Winston-Salem. Tickets for the concert are $25 regular and $20 student (with valid ID) and can be purchased at uncsa.edu/performances or by calling the box office at 336-721-1945. "Seeing the Chamber Music Society of Lincoln Center perform locally is an incredible opportunity for Triad arts-lovers," says Brian Cole, dean of the School of Music. "Our patrons will hear some of the world’s most-talented musicians play on a UNCSA stage for a fraction of what you’d pay in New York City." Cole continues, "In addition, while the ensemble is in town, our students will receive expert instruction from the musicians. CMS Artistic Director and renowned pianist Wu Han will lead a masterclass before the concert." This visit continues a collaboration between UNCSA's Chrysalis Chamber Music Institute and the Chamber Music Society of Lincoln Center. Officially announced in October 2015, the partnership brings CMS artists to UNCSA for concerts and master classes at least twice a year. Chrysalis Institute students also have the opportunity to participate in CMS master classes at Lincoln Center. 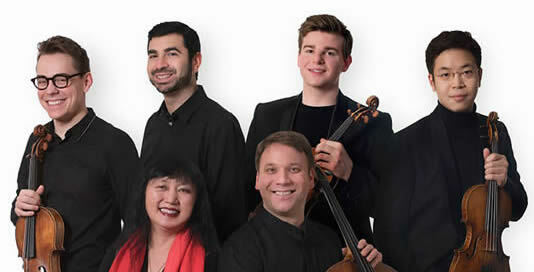 The touring ensemble features Paul Huang and Chad Hoopes, violin; Matthew Lipman, viola; Wu Han and Michael Brown, piano; and Dmitri Atapine, cello, performing "Selected Slavonic Dances for Piano, Four Hands" and "Quintet in A major for Piano, Two Violins, Viola, and Cello" by Dvořák as well as Brahms' Trio No. 3 in C minor for Piano, Violin, and Cello, Op. 101 and "Selected Hungarian Dances for Piano, Four Hands." Dmitri Atapine has been described as a cellist with "brilliant technical chops" (Gramophone), whose playing is "highly impressive throughout" (The Strad). He has appeared on some of the world's foremost stages, including Alice Tully Hall at Lincoln Center, Zankel and Weill halls at Carnegie Hall and the National Auditorium of Spain. An avid chamber musician, he has previously performed with The Chamber Music Society of Lincoln Center and his frequent festival appearances have included Music@Menlo, La Musica Sarasota, Pacific, Aldeburgh, Aix-en-Provence, Nevada and Cactus Pear, with performances broadcast in Spain, Italy, the U.S., Canada, Mexico and South Korea. His multiple awards include the first prize at the Carlos Prieto Cello Competition as well as top honors at the Premio Vittorio Gui and Plowman chamber competitions. He has collaborated with such distinguished musicians as Cho-Liang Lin, Paul Neubauer, Ani and Ida Kavafian, Wu Han, Bruno Giuranna and David Shifrin. His recordings, among them a critically-acclaimed world premiere of Lowell Liebermann's complete works for cello and piano, can be found on the Naxos, Albany, MSR, Urtext Digital, Blue Griffin and Bridge record labels. Atapine holds a doctorate from the Yale School of Music, where he was a student of Aldo Parisot. Currently the artistic director of Apex Concerts and Ribadesella Chamber Music Festival, he is also the cello professor at the University of Nevada, Reno, and a member of Chamber Music Society Two. Pianist-composer Michael Brown, winner of a 2015 Avery Fisher Career Grant, has been described by the New York Times as "one of the leading figures in the current renaissance of performer-composers." In 2017-18, he tours a program commemorating Leonard Bernstein's centennial as well as a duo recital with cellist Nicholas Canellakis. Selected by Sir András Schiff for his Building Bridges in 2016-17, Brown made debut solo recitals across Europe and at New York's 92nd Street Y. Recent concerto debuts include performances with the Seattle, North Carolina, Erie, New Haven, Albany, Maryland and New York Youth Symphony Orchestras. He will be featured as a soloist with the Seattle Symphony and Ludovic Morlot in an upcoming release of Messiaen's music and as a soloist with the Brandenburg State Symphony in a world premiere recording of Samuel Adler's First Piano Concerto. As a composer, he is in residence with the New Haven Symphony for the 2017-19 seasons. Other commissions include works for the Maryland Symphony, the Look & Listen Festival and a work for a consortium of gardens around the U.S. A native New Yorker, Brown earned dual bachelor's and master's degrees in piano and composition from The Juilliard School, where he studied with pianists Jerome Lowenthal and Robert McDonald and composers Samuel Adler and Robert Beaser. He is the first prize winner of the 2010 Concert Artists Guild Victor Elmaleh Competition, a Steinway Artist and a member of CMS Two. Co-Artistic Director of the Chamber Music Society, pianist Wu Han is among the most esteemed and influential classical musicians in the world today. She is a recipient of Musical America's Musician of the Year award, one of the highest music industry honors in the US, and has risen to international prominence through her wide-ranging achievements as a concert performer, recording artist, educator, arts administrator and cultural entrepreneur. Wu Han appears extensively with CMS; as a recitalist with cellist David Finckel; and in piano trios with violinist Philip Setzer. Along with David Finckel, she is the founder and Artistic Director of Music@Menlo, Silicon Valley's acclaimed chamber music festival and institute; co-founder and Artistic Director of Chamber Music Today in Korea; and co-founder and Artistic Director of the Chamber Music Workshop at the Aspen Music Festival and School. Under the auspices of CMS, David Finckel and Wu Han also lead the LG Chamber Music School in South Korea. Wu Han is the co-creator of ArtistLed, classical music's first musician-directed and Internet-based recording company, whose 19-album catalogue has won widespread critical praise as it approaches its 20-year anniversary. Recent recording releases include "Wu Han LIVE II" and "Piano Quartets," a Deutsche Grammophon release recorded live at Alice Tully Hall with cellist David Finckel, violinist Daniel Hope and violist Paul Neubauer. Wu Han's most recent concerto performances include appearances with the Aspen Chamber Orchestra, the Atlanta Symphony and the Philadelphia Orchestra. Acclaimed by critics worldwide for his exceptional talent and magnificent tone, American violinist Chad Hoopes has appeared with numerous ensembles throughout the world since he won first prize at the Young Artists Division of the Yehudi Menuhin International Violin Competition. Recent highlights include his debuts with Orchestre de Paris, Philadelphia Orchestra at Bravo Vail, National Symphony Orchestra at Wolf Trap and Konzerthausorchester Berlin. In 2016, he made his London debut at Royal Festival Hall with the National Youth Orchestra of Great Britain and conductor Kristjan Järvi performing Michael Daugherty's violin concerto "Fire and Blood." In the same season, he became Munich Symphony Orchestra's first artist-in-residence, a position created specifically for him. Among the current season's highlights are performances with Orchestre National du Capitole de Toulouse and Queensland Symphony Orchestra as well as recitals at the Ravinia Festival and Lincoln Center. He has performed with leading orchestras such as the San Francisco, Pittsburgh and Houston symphonies. He received an Avery Fisher Career Grant in March 2017 and the Cleveland Arts Prize in 2013. His debut recording with the MDR Leipzig Radio Symphony Orchestra under Kristjan Järvi was released in 2014 on the French label Naïve and was enthusiastically received by both press and public. Hoopes attended the Cleveland Institute of Music under David Cerone and Joel Smirnoff, and the Kronberg Academy under the tutelage of Ana Chumachenco. In 2014 he became a member of the CMS Two Program. He plays the 1991 Samuel Zygmuntowicz; ex Isaac Stern violin. Recipient of a prestigious 2015 Avery Fisher Career Grant and a 2017 Lincoln Center Award for Emerging Artists, Taiwanese-American violinist Paul Huang is quickly gaining attention for his eloquent music making, distinctive sound and effortless virtuosity. The 2017-18 season sees his debuts at the White Nights Festival in St. Petersburg at the invitation of Valery Gergiev and with the Berliner Symphoniker at the Berlin Philharmonie, as well as engagements with the North Carolina Symphony, New Mexico Philharmonic, Knoxville Symphony, Louisiana Philharmonic and Taipei Symphony (both in Taiwan and on a U.S. tour). He also embarks on a recital tour through La Jolla, Chicago, Toronto, Palm Desert, Taiwan (three-city tour) and New York that culminates at the Kennedy Center in Washington, D.C. He continues his association with the Chamber Music Society of Lincoln Center for three separate tours in the US, Europe and Asia, and returns to Camerata Pacifica as a principal artist. His first solo CD, a collection of favorite encores, is on the CHIMEI label. Huang, who earned his bachelor's and master's degrees from The Juilliard School, won the 2011 Young Concert Artists International Auditions. He plays the Guarneri del Gesù Cremona 1742 ex-Wieniawski violin, on loan through the Stradivari Society, and is a member of Chamber Music Society Two. The recipient of a prestigious 2015 Avery Fisher Career Grant, American violist Matthew Lipman has been hailed by the New York Times for his "rich tone and elegant phrasing." In demand as a soloist, he has recently performed concertos with the Minnesota, Illinois Philharmonic, Grand Rapids Symphony, Wisconsin Chamber, Juilliard, Ars Viva Symphony, Montgomery Symphony and Innsbrook and Eggenfelden Festival orchestras and recitals at the WQXR Greene Space in New York City and the Phillips Collection in Washington, D.C. Highlights this season include a debut solo album on Cedille Records and performances of the Telemann Viola Concerto in Alice Tully Hall. Lipman's recording of Mozart's Sinfonia Concertante with violinist Rachel Barton Pine and the Academy of St Martin in the Fields with Sir Neville Marriner reached No. 2 on the Billboard classical charts. He was the only violist featured on WFMT Chicago's list of 30 Under 30 top classical musicians and has been profiled by The Strad and BBC Music magazines. He performs internationally as a member of Chamber Music Society Two and at the Music@Menlo, Marlboro, Bad Kissingen, Malaga and Ravinia festivals. A top prizewinner of the Primrose and Tertis International Viola Competitions, he received his bachelor's and master's degrees from The Juilliard School, where he continues to serve as teaching assistant to Heidi Castleman, and is mentored by Tabea Zimmermann in Kronberg, Germany. A native of Chicago, Lipman performs on a 1700 Matteo Goffriller viola loaned through the generous efforts of the RBP Foundation.